Announcing the First Ever English Banana Summer School – 13th-17th August 2012! 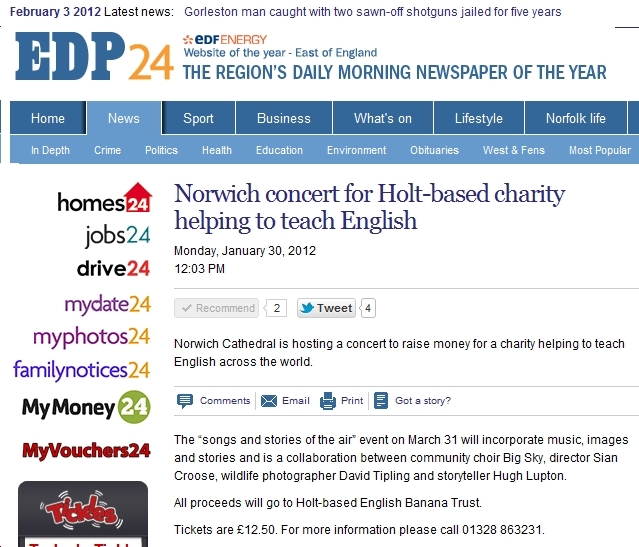 The Opportunity of a Lifetime for English Teachers Using English Banana Materials! Free Teacher Training in the UK! 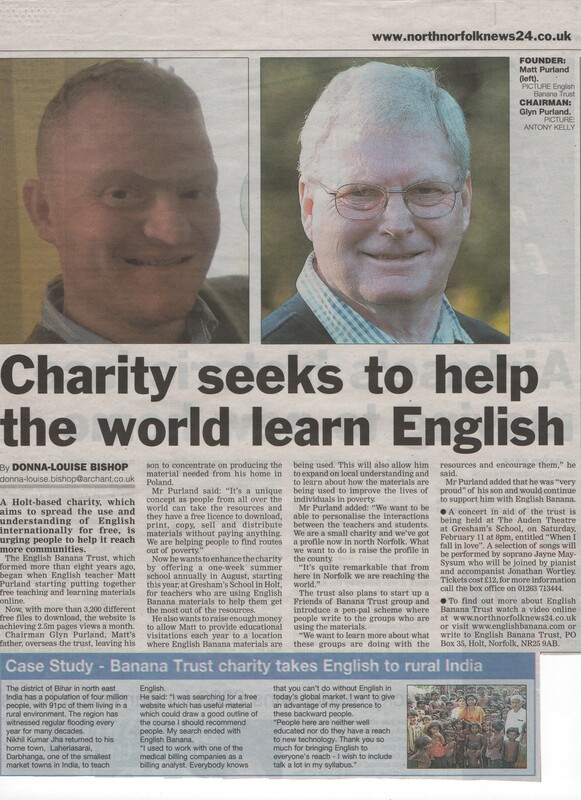 English Banana Trust (founded in 2008) aims to support teachers who are helping people to find a route out of poverty through learning English. 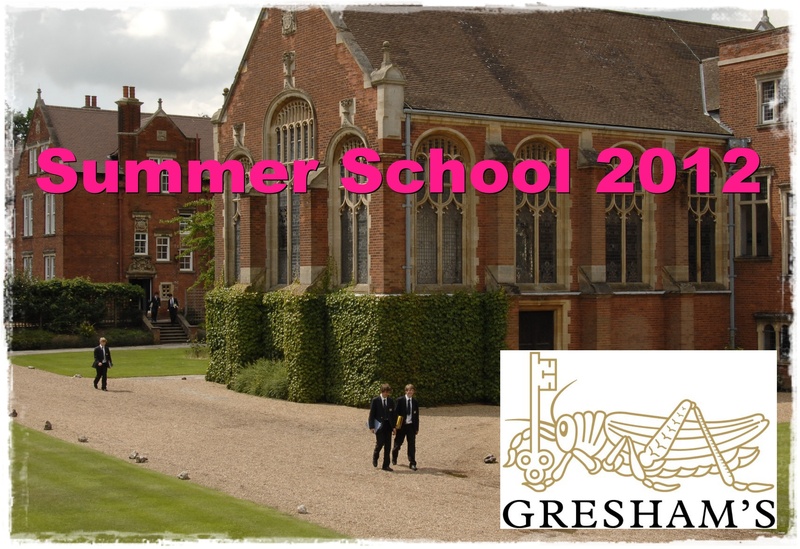 We are currently inviting applications for the first English Banana Free Summer School, which will be held at the prestigious Gresham’s School in Holt, Norfolk, England this summer from 13th to 17th August 2012. This summer school gives you the unique opportunity to learn how to get the most out of English Banana worksheets and books with the author of the material – English teacher and writer Matt Purland. As you improve your teaching skills through a series of practical, hands-on sessions, you will learn a wide range of valuable and effective teaching methods that you can take home with you and share with your colleagues. The programme will also include other expert educational input and a range of activities designed to support you in your work environment after the school has finished. If you are accepted as a delegate to the Summer School, all residential, travel and teaching costs in England will be paid for by the Trust, together with a contribution towards travel to the UK and associated costs, of up to £400 sterling. Professional English teachers (including ESL, EFL, TEFL) aged 21 or over, living in the UK or overseas. You must be able to demonstrate that you are using English Banana materials in your school and have a strong interest in learning how to use them more effectively. 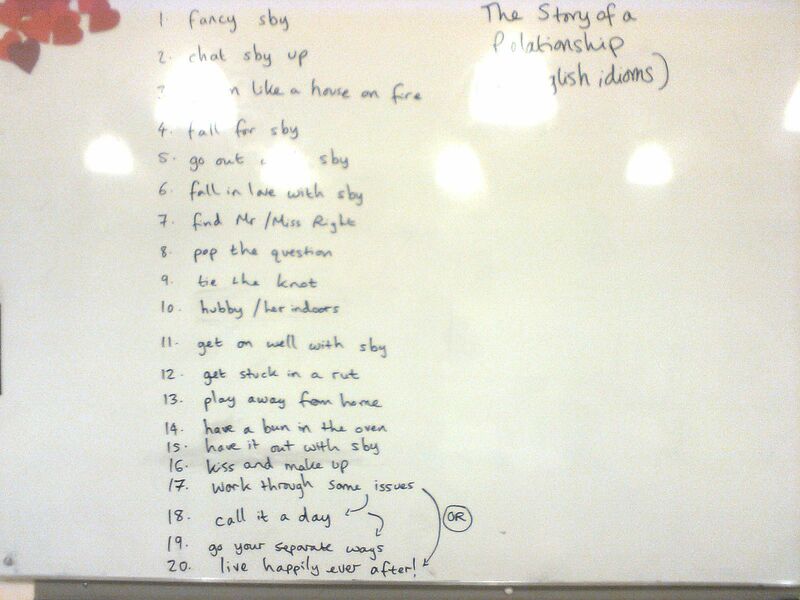 4) A description of your current teaching situation, e.g. self-employed, private lessons, language school, college, university, state school, etc. Categories: English Banana Trust, Events, Latest Projects, News, recommended, summer school | Tags: English, English Banana Trust, ESL, free, practice, professional, summer school, teacher | Permalink. Categories: Online Lessons, Pronunciation, recommended, Video | Tags: EFL, English, ESL, pronunciation, sounds, speaking, speech, teacher, video | Permalink. Categories: English Banana Trust, Free Licences, Latest Projects, News, recommended, summer school | Tags: English, English Banana Trust, ESL, free, free copying licence, learn, material, news | Permalink.